This would imply that we finally have a decent integration, including data refresh! As far as I know, this is crucial, but was not possible until now! Exactly what it says – The application is now able to download the exchange rates and add it in the Exchange Rate tables. Can’t imagine this hasn’t been built by many partners – we had our own solution for this for years! Another service Microsoft Dynamics NAV 2016 uses, is an OCR Service from Lexmark, and is integrated in the “Incoming Documents” functionality. As such, you’re able to send a scanned (or picture) purchase document, and the OCR will try to extract valuable data from the picture. 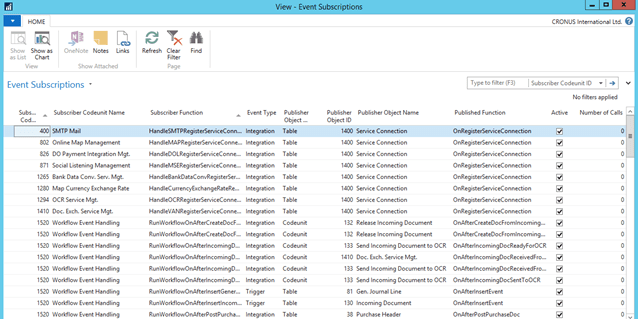 You probably all have experimented with the old CRM Connector, and came to the conclusion: it sucked! No flexibility, not stable, … we tried to implement it a few times, but always had to turn to third party solutions, which is hard to sell for customers that buy 2 Dynamics products.. .
One of the biggest new things in NAV! 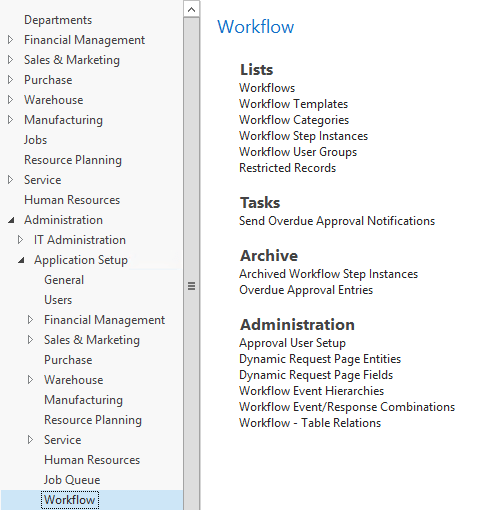 Based on Eventing (see later in this post), you are able to create your own workflows. Configurable as you like it. You’re able to create your own workflow-events (either in code and using the workflow framework, or using pre-configured workflows) with conditions, and responses (like mail, notification or whatever). I have been blogging about it here, but that’s just a small post about a big feature. I strongly recommend to dive into it. It’s a great framework, and you can apply lots of things on it! The only remark might be is that you’ll probably have to add code to make it work like you want. But that’s ok. It should be treated as a framework instead of a complete solution anyway (in my opinion)! I’m very excited about this addition. The Test Toolset has been out there for years – but now it’s supported, extended and released for all supported countries. The framework has been extended, and out-of-the-box, there are about 15000 tests available! This is a few days of topics to explain this. Eventing is something very common in the .Net world, but now, with Eventing in NAV, we can benefit from it as well. Eventing consists of “publishers” and “subscribers”. A publisher raises an event in code when something happens, like “OnBeforePostDocument” in codeunit 80. A subscriber is a function that subscribes to an event. In a way, we can create a function, add the property “subscriber” to it, and assign it to a specific published event where we want to assign the function to. This would mean, when the published events gets executed, all the “attached” subscriber functions get executed as well. Also something that is difficult to explain in a few words. A Customization Extension can be seen as an enhanced fob file which only contains delta’s. This is a very rudimentary description, but really .. If you hold yourself to a few limitations (which will be blogged about a lot), you are able to create a so-called “navx”-file. This navx file contains information/deltafiles/permissionset/.. , and can be published and installed to other databases. It can even be installed on specific tenants, which makes it possible that you do specific customizations to specific tenants in a multitenant environment. Again, this is just a short description, but actually it’s a huge thing! I have had a session on best practices about these extensions at Directions EMEA, and will be doing the same session on Directions US. A lot more to come about this topic! 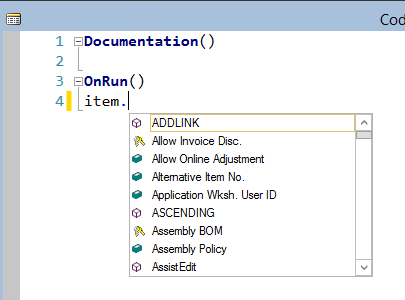 Great for developers: finally we have code completion and intellisense as coding editor within C/SIDE – already in the year 2016! :-). I won’t go too deep into it. Vjeko has explained this extensively on his blog. A non-NAV developer is not amazed, I know, and he shouldn’t be – but we are, aren’t we :-). You can drill down to each entry. A try-catch for NAV! Yes, really! One thing to notice, though .. When a Try-function fails, the transaction is NOT rolled back! This is something to keep in mind! This is by design. You catch the error, not the transaction! Vjeko explained this in an extensive blogpost! THE big secret. Microsoft is taking the infrastructure-challenge for setting up multitenant cloud services based on NAV out of our hands. This was a big hurdle, so this service is a big help for partners. I truly believe that. I haven’t got any details yet on how to start using it and such, or any screenshots, but I’ll try to figure out. a few remarks on this one may be: it is only intended for multitenant solutions, and you HAVE to upgrade to a new Cumulative Update at least each three months! We can now add an Add-in as a zip file to the Add-in table, and NAV will make sure they get deployed to the clients, when necessary. Which will result in faster processing for memory-intensive operations, like (for example) reports. Like an AutoIncrement, this BigInteger field with type “Timestamp=Yes” will maintain itself .. On each modify, a new timestamp value will be added to the record. This is great for interfacing, to find out which records have changed since a specific timestamp. Only for .Net objects, but very useful! Used to loop .Net collections! Really good addition to be able to test a certain varaible wheter it is Temorary or not.. . I think we were only able to do this on a RecRef – will, now we can do it on a Record-Variable as well! Thanks, Soren, to get this added! Same for the “RECORDID” property – we do not have to use the RecordRef anymore to get to the RECORDID. Installing NAV2016 will overwrite the 2015 administration tool. Arend Jan blogged about that here: http://kauffmann.nl/index.php/2015/10/07/nav-2016-installation-overwrites-nav-2015-administration-tool/ . He also mentioned how to fix it! Apparently, the GetDatabaseTableTriggerSetup is executed every time it enters a table, instead of only once per table. This has been mentioned on Twitter, but I have not had the time to confirm it yet, though. This might result in some performance issues! As far as I know, all issues that were reported will be fixed in Cu1. But that’s not a promise ;-), that’s an assumption (which is mother of all….). OK, guys and girls! Hope you liked it, hope it’s somewhat complete. Probably not. If not, please drop me a comment! Maybe you know what happened to our good old NASHandler function in Codeunit 1? Looks like it is gone. Is it replaced by codeunit 450, to start all kind of functions using the jobqueue? Is it not possible anymore to use a NAS for other stuff? Codeunit 44 NASManagement doesn’t exist as well. Could very well be that it’s gone, but why would you need it? There are enough options now to start your NAS, no? You have the Job Queue, and you have the possibility to start one codeunit separately. You can always “mimic” the NAShandler function if necessary.. no? the NASHandler function uses it to start codeunit 450. So I wonder if this behaviour is changed and if it is codeunit 450 that gets started automatically when a NAS gets running. never mind, still used to “the old” NAS, just read that it is possible to start a NAS and specify which codeunit to start. do you have more details about the ocr service? is it only an online/cloud service, is there also an offline ocr service ? are there any requirements to use it ? It uses an online service from Lexmark – or that’s what I remember. You have to sign up, and as far as I remember, you can use the service 75 times for free. That’s all details I have, I’m afraid. thx a lot. maybe more info after the navtechdays (sesion ocr). regards. I had so much hope in the OCR, but with this stupid Lexmark Cloud Service it is totally useless for our Companies. Why cant MS develope an own OCR dll-service to use offline! so it’s best to purchase third party add-in for offline ocr functionality, e.g. I also didn’t think I would ever use the old editor anymore, but the new code editor didn’t allow to select all (ctrl+a) code in a object and DELETE all code. Using the old editor still allows to do this efficiently. Thanks for the insightful post. 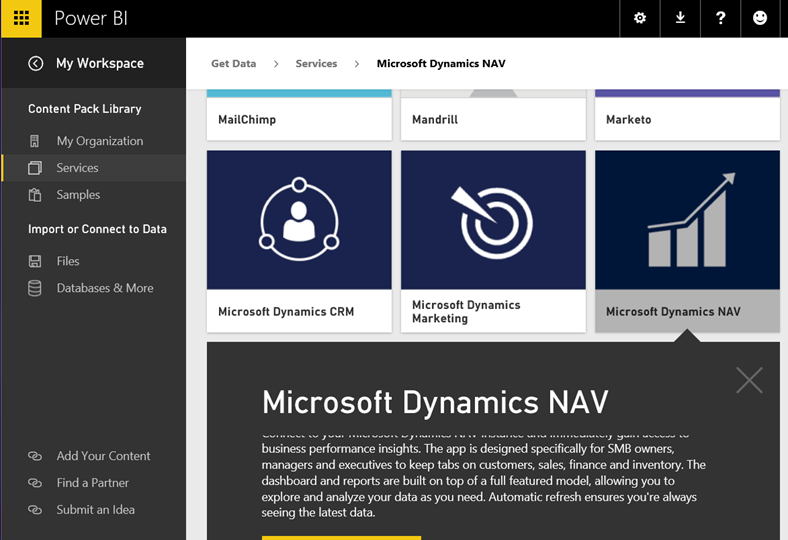 On the CRM connector piece… does the new nav functionality only work with the online CRM version or will it work with the on premise version of crm as well. WE are looking to upgrade both nav and crm next year. (both to 2016) and getting rid of the connector is one of my strong selling points for the why upgrade. not knowing anything about CRM, I assume (..) it supports OnPremise as well as Online..